Canon has announced the Sumire Prime collection, a set of seven Canon cinema lenses that use the PL-mount — a first for Canon, who has previously only ever offered its cinema primes in its own EF-mount. The Sumire Prime lens collection includes the 14mm T3.1 FP X, 20mm T1.5 FP X, 24mm T1.5 FP X, 35mm T1.5 FP X, 50mm T1.3 FP X, 85mm T1.3 FP X and 135mm T2.2 FP X. All of the lenses in the collection feature an 11-bladed iris, are color balanced across the lineup and have the same minimized focus breathing as Canon's EF-mount cinema prime lenses. Sumire — pronounced 'soo-mee-ray' — is a word of Japanese origin that is most often associated with 'a floral gentleness and beauty,' a characteristic Canon sees in its new lens collection. Beyond a whole host of third-party full-frame and Super 35mm PL-mount cameras, the Sumire Prime lenses will work with Canon's entire lineup of Cinema EOS full-frame and Super 35mm 4K cameras as well. In the event an EF-mount is needed, Canon is offering the option to swap the PL-mount for an EF-mount at its Canon Factory Service and Repair center, a process that can be reversed if needed. The Canon CN-E24mm T1.5 FP X, CN-E35mm T1.5 FP X, CN-E50mm T1.3 FP X and CN-E85mm T1.3 FP X lenses are scheduled to be available in Summer 2019; the Canon CN-E14mm T3.1 FP X lens in Fall 2019; and the Canon CN-E20mm T1.5 FP X and CN-E135mm T2.2 FP X lenses in Winter 2019/Spring 2020. 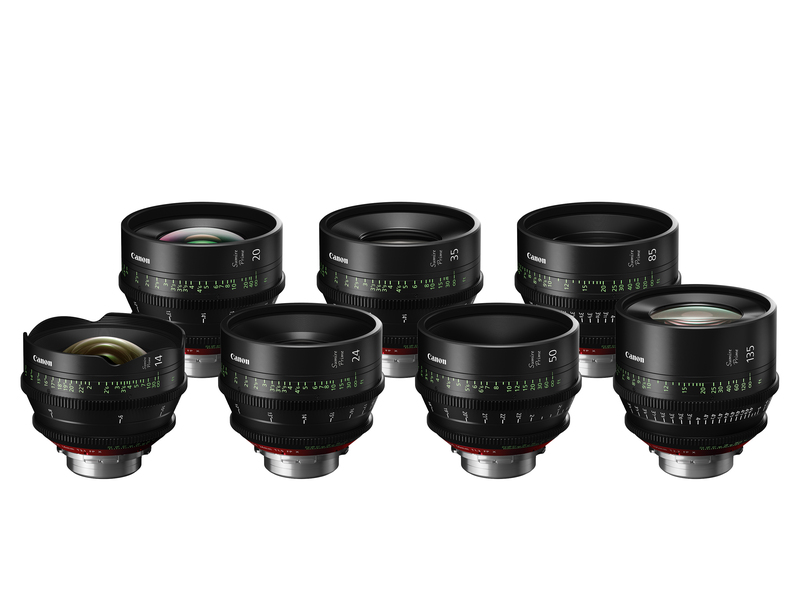 MELVILLE, N.Y., April 3, 2019 – Covering the core range of focal lengths that cinema professionals desire, Canon U.S.A. Inc., a leader in digital imaging solutions, is excited to announce the company’s first set of seven cinema prime PL-Mount lenses, aptly named Sumire Prime. Pronounced“Soo-mee-ray,” the word is of Japanese origin and is associated with a floral gentleness and beauty. Sumire Prime Lenses offer a unique artistically pleasing look with gentle and beautiful skin tones and smooth bokeh, designed for use with large-sensor cinema cameras, including 35mm full-frame cameras such as the EOS C700FF Cinema Camera. In addition to bright T-stops and Canon’s renowned warm-color imagery, a unique optical design introduces a nuanced look as the lens aperture approaches its maximum setting - subtly modifying the textural renderings of the human face closeup. It also smooths the transition to the fall-off portions of the scene resulting in a pleasing bokeh. This combination adds emotional expressiveness and provides creative flexibility to create a memorable scene. The highly durable Sumire Prime lenses feature the same outstanding operability and reduced focus breathing as Canon’s well-established EF-Mount Cinema Prime Lenses. Manual operation provides users with the resistance they desire to make precise changes in focus. A 300-degree focus rotation angle and gear position is consistent across the entire Sumire Prime series of lenses - eliminating the need to adjust gear positions when changing lenses. I guess I'd rent the set of Shneiders, instead....roughly the same cost. I'd gain NOTHING having T1.3 or T2.0, both have very thin DOF. By the way, focusing is still done via marks (tape) on the floor....for those that are unaware. All these cine lens makers are just like those Luxury Cape Verde real estate developers...a bunch of pension fund scammers. The level of precision and quality control that goes into a good cinema lens is light years beyond what goes into a good stills lens. Additionally, most of the people who use cinema lenses for projects rent them; they don't buy them. Most of these will be purchased by rental houses and larger production companies, where they will be used for many decades to come. For what you get, and for what goes into designing and producing them, the price is fair. @NemanRa, are you saying that it's unbelievable that there can be a 10K+ dollar commercial video shoot? Because 10K is one heck of a cheap shoot when you are dealing with a client who wants good production value. When you figure in cost of camera dept. gear, grip and electric gear, location, insurance, crew, creative team, post production team, etc., ten thousand dollars doesn't get you very far at all. @Nemanra Yes I do unfortunately get how that would feel too much. I live in a country where the government gives me a salary of 180 dollars a month as full time dentist. This isn't a typo. To make enough money I started a video production company, and the regular price for a video shoot (like a local commercial for a shop/cafe) is 200 USD and the typical wedding shoot fee is around 300 USD. It isn't as bad as it seems as the country offers ridiculously cheap proces on everyday life products like food and clothing, but it's as brutal as you'd imagine when buying electronic devices like cameras, lenses, phones, etc. i understand you perfectly, my friend. “The bokeh comes alive in ways that weren’t occurring with other lenses I’ve used. Lens flares have a dynamic feel to them, rather than behaving in a formulaic manner." "Sumire in Japan is the name of a flower, and like the petals of a flower, our lenses are most beautiful when fully opened." - Kazuto Ogawa, president and COO, Canon U.S.A., Inc. But who really will use these manual focus lenses at f1.2/1.4/2 for movies on FF sensors? Focusing at those apertures will be very very hard for anything other than completely still subjects. I shoot stills and vid with declicked Samyang primes on Nikon and BMP. Manual, decklicked, prime are the key factors. The rest is up to the available light and conditions. I like my footage to be as sharp as possible. Atmospherics are a matter of taste and logically you do that in post. Bokeh is boring. Focusing peoples attention on the screen centre can be done differently today. There was a time when a great apparent depth of field was about creating the illusion of reality. Now, bokeh is part of the grade school vocabulary. This set is perfect for the Sound of Music followup. 'soo-mee-ray' should be Doe Re Mi. Note as in all things the Dough comes first. Canon are one confused company! They have had CN-E primes out for a few years now but only available in Ef mount, as well as having CN-E zooms available in PL mount which makes it impossible to make a set of matched lenses in PL mount, now they released a set of PL lenses several years later which claim to have a softer and more natural look. Im afraid owners (myself included) looking for a nice set of PL lenses have moved on to one of many offerings by companies like, Sigma & Zeiss. One can pre-order them at B&H Photo Video. Each lens costs $7,410. These are not newly designed lenses. Canon has the same set of cine lenses in ef mount, which have been on the market for a while. And I think many of these lenses were designed based on the ef autofocus counterparts. new optical designs according to canon. I agree with Ebrahim. They look extremely similar to the original CN-E primes, which are based off EF-mount L lenses. From reading the press release it seems like the main addition is an apodization element, hence the stuff about smoother bokeh. This makes sense considering that Canon also recently announced an RF lens with apodization. Add some small changes to reduce breathing and color inconsistency, a new housing, and you have the Sumire lenses. 20mm was announced last year. j_yeezy: These can't have apodization -- the T numbers would be a lot different. How many companies sold cine lenses ten years ago and how many do now (counting also announcements like this)? Am I alone in thinking that this number seems to have doubled? Is this partly because streaming services have ushered in a 'golden age of television', if we look at number of TV shows being made and how high quality they are? No it's because you don't need a cinema camera to use cine lenses anymore. Ten years ago all we had was the 5d Mark II that could seriously be used a cine d cam. Now we have adapters and really nice MILC's that can actually shoot cinema level quality so the demand for cine level glass has increased. And which of all those really nice MILCs have PL-mounts? I don't doubt that mirrorless and more generally the increasingly good video modes of affordable still ILCs have spurred a lot of video shooting. I'm just not sure how large the overlap between mirrorless and $5000+ cine lenses is. They make plenty of PL mount adapters and they're relatively inexpensive because they don't need any electronic connectors. Even if you think about Cine cameras 10 years ago, MILCs are comparable to those cameras. I mean the Arri Alexa wasn't even a true 4K camera until last year. Like the C100 is built like a cine camera but honestly when it comes to IQ the GH5 has the potential to destroy it. (Don't get me wrong, I loooooove the image out of the C100). Also if your budget comes down to either a super nice camera and alright glass or a GH5 with some really nice cinema glass, I think most would take the later. They're making more cinematic productions because cinema quality cameras, mainly MILC, are easier to come by. Most of the cinematic online content creators use MILC's. The bigger sites are using C300's and FS7's but even those don't come in PL mount. You kinda just further proved my point by trying to disprove it. We're not in much disagreement and I'd never try to disprove something unproven to begin with, we're just giving views, yes MILC's definitely increased cine lens usage, but my point was that the DSLR revolution was the main trigger, not mirrorless cameras per se, and yes the DSLR revolution LED to MILCs which in turn further increased cine lens usage. How hard would it be to start a business rehousing these cheaply? The high-end (ARRI, Master Primes) has also seen new entrants with Leica/Leitz having multiple lens lines for example (though they also offer rehoused M lenses). RED lenses are also rather high-end. The Zeiss Supreme primes are as well at the higher end of the price range. But (new) cameras are certainly a key driving force behind the growth in cine lenses. In a sense RED lenses only came to life because digital sensors enabled a new entrant on the camera side. And, as you said, DSLRs (and later MILCs) provided a much cheaper (digital) way to produce high-quality video than was available before. A number of them using the 35 mm format, they also spurned the appearance of (more) cine lenses covering 24 x 36 mm (in the form of rehoused still photography lenses but also new cine-only designs). A set of Sigma's 18-35mm, 35mm 1.4, 56mm 1.4, and 85mm 1.4 is also highly desirable for S35 cine cameras. Finding the good M42 and old Pentax primes that sell for 10 bucks, I would buy a set of Nikon's pre-Ai 17-40mm 2.8. 24-70 & 70-200 if they were rehoused well for reasonable cost. How about sigma ART primes set? Many great stills lines should be modified to make our lives easier as videographers really. 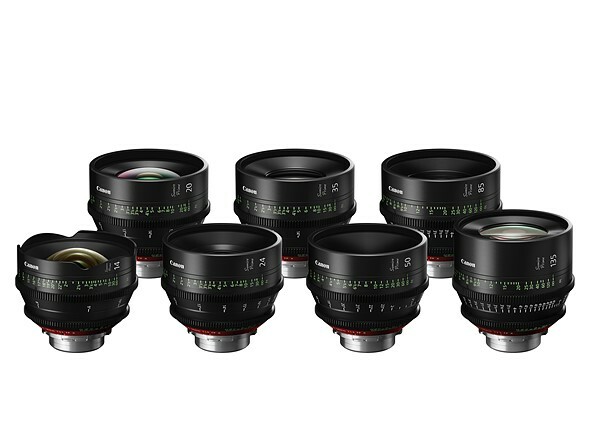 Cinematic lenses of this sort are hand assembled and tuned, and priced accordingly. For comparison, Zeiss entry level cinematic primes cost about $5K each. If you hadn't noticed, they are huge, for compatibility with remote focus and aperture control. The closest I come is with a Sony PZ 28-135/4, which takes a 95 mm filter. Neither Canon nor Nikon have ever marketed a color-matched set of primes for still photography. Zeiss, on the other hand, does this consistently across product lines - for example Otus, Milvus, Loxia and Batis. I find it rewarding to shoot landscapes and video with a set of Loxia manual lenses, at a fraction of the cost of cinematic lenses. I am experimenting with remote focus control and Loxia lenses and a Ronin S gimbal. It is easy to set near and far focus points, then jump smoothly and accurately between them, something you see often in movies. It's not all that easy to focus on an arbitrary subject in real time, unless you add a 2 lb monitor to the system. I don't need them, but man, they do look pretty in the a set. and these glasses are coming for EOS RF too? 2.0/135 mm? No 1.8/135 mm for extender use??? so, beside 1.4/20 mm - business as usual - nothing to wait for - for me. Ha? Red cinema cameras, Alexas, Canon C100/300/500/700, Panasonic's Varicams, Blackmagic Ursas, Even Sony's F65, F55, F5, all have this mount and lens design. It's the cinema industry standard for lensing and they can't make it RF or so. These lenses weren't created for amateurs or still photographers. While they can easily be modified for EOS mounts, they all come with PL mounts. You have to wonder why any amateur or still photographer would buy these lenses but I suppose it is still nice to have that option. Obviously.... there is big money in cinema lenses. And nice profit margins too. So Canon is shoring up their bottom line by creating more products for very high end users. You really have to give Canon credit for doing something that smart. I agree. I think Canon is killing it in the mid range Cine camera arena. The C300 Mark II is just a marvelous beast. Also in a 4K world, the C100 still holds up so well. I love the image that comes out of that camera. Also Canon produces a beautiful 8 bit proxy codec that's pretty unbelievable. Just the name I would have picked, but glad to see the X in the names. I wonder if there will be an EF 20mm f/1.4 as a result. Usually the Cine primes seem to follow EF? Drop the pronunciation attempts...R's are pronounced "L" in Japanese. The "re" is pronounced "le" as in "let". Or just let everybody do their worst. Wrong pronunciations are just wrong and yours isn't better than anyone else's. @S Yu: The pronunciation was provided directly from Canon, as you can see in the embedded press release above. Wow, dpreview! Really? Why did you delete the few informative and respectful comments about Japanese pronunciation that were previously here!?! Some photographers like to know what the original pronunciation of a japanese word was. I am quite puzzled. The Japanese “R” is almost the same as the Italian/Latin “rolled” R, which is pronounced by touching the tongue on the roof of the mouth. The only difference is that Japanese “R” rolls the tongue a bit less. It is quite distinct from both L nor R in English. @Gannon Burgett Then that official Anglicization would sound too far off from the original. In fact I find it confusing why they chose such a Japanese word that doesn't stand well to Anglicization. @quiquae Interesting way to put it, as I'm not familiar with Italian or Latin I have no idea how close that R is to Japanese, but I would really say that D in Japanese is pretty distinct from Japanese R, while it's quite close to English D.
Following this line of argument I would say that having an English speaker pronounce "sumile" as three syllables would end up closer to the Japanese original than pronouncing "sumide", I have no problem imagining that the latter would end up similar to "すみで" instead.